To access Usersync settings, select the Advanced tab on the Customize Service page. Usersync pulls in users from UNIX, LDAP, or AD and populates Ranger's local user tables with these users. (Optional) LDAP/AD. If you are using LDAP or Active Directory authentication, you may need to update the following properties, depending upon your specific deployment characteristics. * Only applies when you want to filter out groups. After you have finished specifying all of the settings on the Customize Services page, click Next at the bottom of the page to continue with the installation. 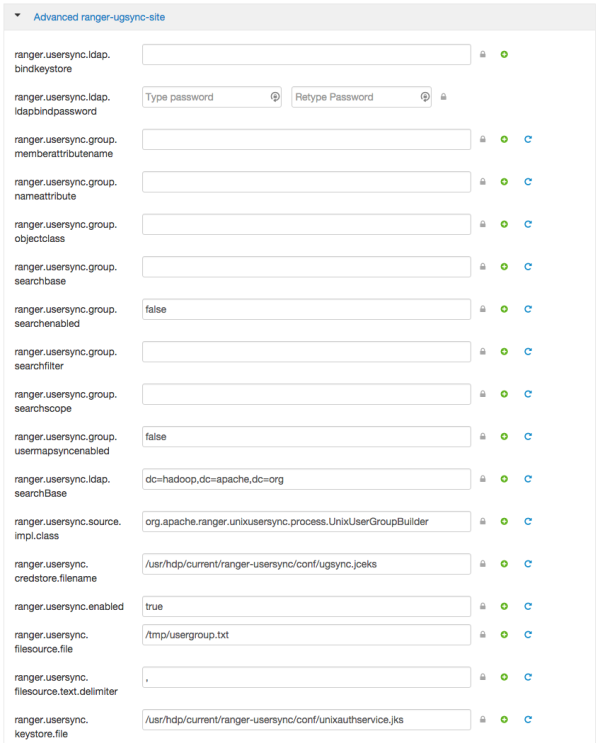 Automatically Assign ADMIN KEYADMIN Role for External Users. You can use usersync to mark specific external users, or users in a specific external group, with ADMIN or KEYADMIN role within Ranger. This is useful in cases where internal users are not allowed to login to Ranger. From Ambari>Ranger>Configs>Advanced>Custom ranger-ugsync-site, select Add Property. The default value is &. The default value is :. The default value is ,.